Philadelphia weddings always look remarkable no matter what time of the year. I especially love to photograph weddings in the Old City. 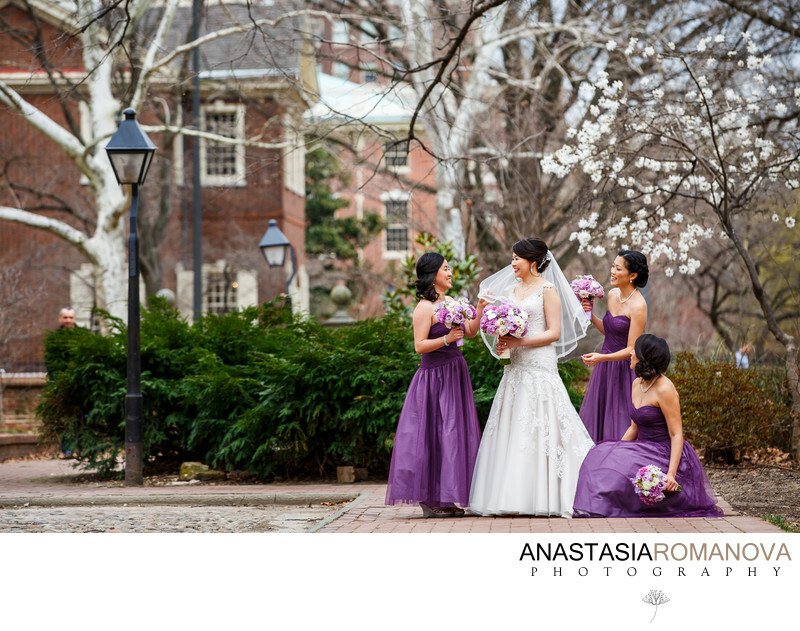 It is the most popular area for the wedding day photographs as there are so many gorgeous venues located nearby the Washington Square Park, Independence Square, Liberty Bell, The Second National Bank of America, The Merchants Exchange Building, The Carpenter's Hall and others. This shot was taken during Jessica and Kelvin's wedding at the Down Town Club, one of the most exquisite Cescaphe Event Group venues. It was just the beginning of spring, but we were more than lucky to find some trees already in blossom. The couple's first look took place at the Second National Bank of United States, and the bridal party portraits followed right after. The bridesmaids' purple dresses and delicate bouquets added some extra vibrancy to the overall scene which was a huge benefit for more colorful imagery on that overcast day. I must admit that the Beautiful Blooms team did and extraordinary job as always with the bridal and bridesmaids flowers! We positioned the bride Jessica and her girls slightly to the side of the blooming tree on order to get some more greenery in the frame as well. All the compositional elements fell into places just as we needed, rendering the charming atmosphere of the Old City Philadelphia. Canon 5D mark III; ISO 200; 150 mm; f/4.0; 1/500 sec.